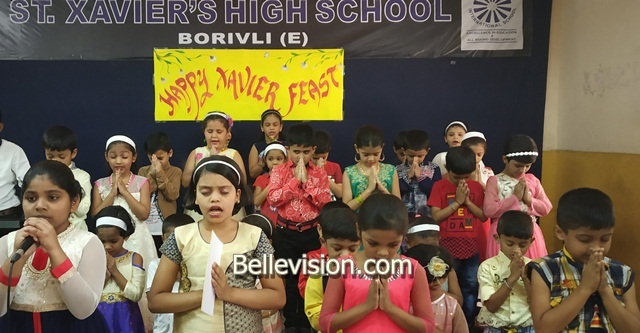 Mumbai, 05 Dec: St Xavier’s High School, Borivali (East), here celebrated feast of their patron saint on Monday, December 3. As a part of the celebration special assembly was conducted in the school from Class VI to Class X between 7:30am to 9:00am and for Class I to Class V between 1:30pm to 2:30pm. Guests Rushabh Shah and Sakshi Shah attended the special assembly in the morning. Special Prayer for the school and the management was held during the assembly. Sweets especially sent by Ryan International Education Institutions chairman Dr A F Pinto and managing director Grace Pinto were distributed to all the students and blessings were given to them on their behalf. All the students participated enthusiastically in the assembly.